Qualcomm is claiming that its next generation of Snapdragon chips will bring greater power to phones than today's gaming consoles. S3 is the current top-of-the-range processor from the chip developer, with mysterious S4 'Krait' devices set to be launched at the end of the year. Qualcomm has said that the S4 devices will include 28nm quad core processors. 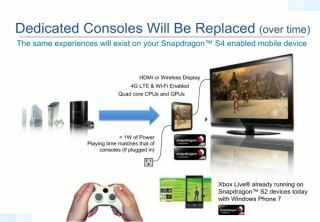 The point of inflexion will come, according to Qualcomm, when it releases that Krait Snapdragon S4 chip, with upgraded Adreno 225 GPU - the power of this will equate to being able to display more fluid and faster graphics on your phone than even a PS3. It unlikely this means that Sony and Microsoft will just pack up and go home, but consider being able to plug your phone into a TV and use it like a console - either with the phone in your hand or via a separate controller. That's a pretty mad scenario considering where phone technology was even five years ago. The improvements to these integrated chip systems means that we'll be seeing quad core phones with radically enhanced GPUs in the next year or so - whether this will be enough to convince studios to release the games capable of taking advantage of this power remains to be seen. What do you think? Would you swap a PS3 for a phone for the added convenience or would you just feel like too much of an early adopter when you have to tell your friends?